How the Royals’ winning streak puts the World Cup pseudo-fandom into perspective. Here the Kansas City Royals stand at first place. The Royals. The Losers. The Jokers. The team that was my team since birth. Here they come. Is this the year? Is this really it? Will the pain, the heartbreak, the sourness, the hate finally wash away? Is this the break from the pain? This is what is going through my head today, as the Royals are bashing their way through a winning streak, demolishing division foes old and new. The demons are being exorcised in the form of Gordons and Butlers. The devil has possessed me long enough. Is this my reprieve? Am I holy once again? As a sports fan, you go through the turmoil every once and a while. Just hold on, just believe, and one day, you will be rewarded for your loyalty. You’ll get box seats in the field of heaven. 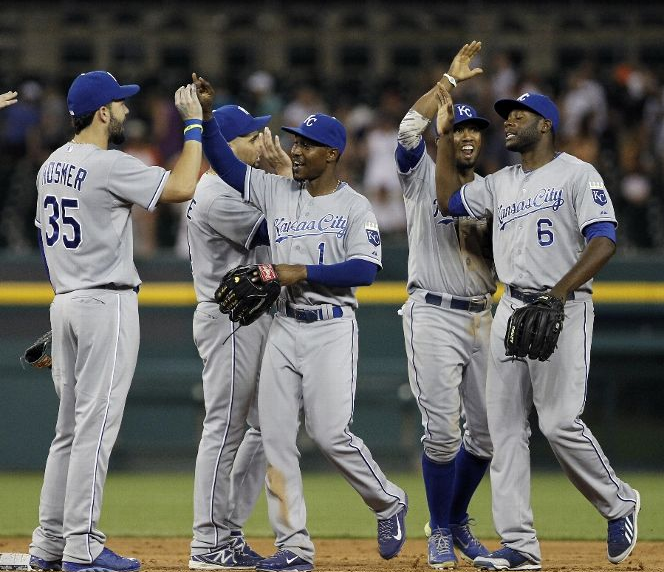 This is the current 2014 Kansas City Royals: sacrifice in the name of faith. If the faith holds true, there is no greater reward. If it folds, well, faith will keep us going. This is how I feel as a lifelong Royals fan. I was in the womb the last time the club made a playoff appearance. This year, more than any other, I have distanced myself from the team. I’ve yet to go to a game, whereas I averaged about 10-20 games in every year since I was a teenager. Some of that is due to my increasingly shortened availability and funds, but a lot of it has to do with me trying to protect myself from getting too close to a franchise that has done nothing but hurt me. I see the Royals like a spurned lover sees potential suitors; I know of nothing but pain, so I refuse to let myself get involved. Of course, the year I do that is the year the Royals march into first place. Faith is tricky. These are the feelings, the emotions, the history and the complexities that have me rolling my eyes during the World Cup. As the Royals push forward, commanding that I make peace with my inner baseball demons and give myself up to the idea of a playoff, I see young people all over the country act as if this soccer match holds meaning to them. It doesn’t. It’s fake fandom, fake patriotism. It’s an event, not a birthright. In Kansas City, people my age have latched on to Sporting KC. Young people in my city don’t care about the Royals or Chiefs – two franchises that represent nothing but losing and gain you very little attention as a supporter – and have instead adopted a fresh new winner with a blingy new stadium. No pain, no heartbreak, just winning and good times and good beer with good friends. Sure, a playoff loss is a bummer for Sporting KC fans. It’s not decades of hurt that pile on and grow moldier every year. It’s just too bad that the next cool event has to wait until next year. The World Cup represents my least favorite thing about sports: insignificance. You ran root for Team USA with the ease of a child because you know they won’t win. Who cares, it sure is fun though! The losses will feel like real hurt, but it won’t be. People don’t dress themselves up in Red, White and Blue because they are so proud of the team they just have to let you know; they are wearing a toga to a party. It’s dress-up, make-believe . It’s a choice. In sports, you don’t get to make choices. You stick with what you got. This is something that seems to be lost on my generation. Baseball and football not working out? Go on to the next one! Hey look, soccer! Are we good at that? Yes? WE BELIEVE THAT WE WILL WIN! WOOOOOOOO! It is extremely easy for Royals, Cubs, Indians, Browns, Jaguars, Astros, Cavaliers, Chiefs, Texans fans and all the rest to turn to soccer as a way out. A Get Out Of Sports Hell Free card. But it’s not real. It doesn’t come with the grasp on your soul the way following a team since you were a child does. That’s what makes sports so meaningful. Sporting KC sells out with a raucous crowd every night, but it will never be the kind of crowd that the Royals will have if and when they play their first home playoff game. Maybe there won’t be a Cauldron or fun chants that everyone in the stadium knows. But there will be this: a shared feeling among thousands of strangers circulating through the air that nobody can describe, but that everyone recognizes. Decades of waiting and hoping, generations standing next to each other praying. Those fans won’t BELIEVE THAT THEY WILL WIN, but they will have a silent faith that is much stronger, much more palpable. If that playoff game does happen, I beg you to find a way to be there. That game will be a religious cleansing, washing away years of baseball sin for a clean slate. The city will be reborn. I’m not even sure Jesus Christ coming back could have the effect a winning Royals team would have on Kansas City. So I will continue to go through my existential sports crisis this summer, as legions of kids paint their faces and pretend that USA vs Random Country means something to them. Sure it does, the same way high school love matters. But I’m a Royals fan. A widower. Good Kansas City baseball is like finding love after that painful death. It’s not as cheery and fun as high school puppy love, but believe me, it matters a hell of a lot more.